I recently saw this post by Bianca over at Goodnight Little Spoon, who got it from Creature Comforts and I thought it would be a really cool post for a bit of a change of pace! I figure I will just list five or six things! Maybe it will give you guys a glimpse into my real life. So here goes! So first up, I figured I would start with the biggest thing that has impacted my life. My disorders. I will never be 'normal'. You can say, "well, what is normal? ", but that really doesn't apply to me. I simply will never be like other people. For the past almost 7 years, I have been dealing with mental instability and mental illness. I am officially diagnosed with bipolar disorder, panic disorder with agoraphobia, generalized anxiety disorder, insomnia, and mild obsessive compulsive disorder. The last two are both sort-of side effects from the bipolar disorder. I am on medication, six different medications to be exact, and I will always have to be on medication. Pills for the rest of my life. It seems daunting, but it's easier for me now given that I have been on meds for so long. I don't sleep without my meds, and really, I can't function without them. I've got my agoraphobia in check (for those who don't know what that means, it's essentially a fear of not leaving one's comfort zones. ), but twice I have stayed in my home for months, the worst being 8 months straight. I am an extremely nervous person, and have regular panic attacks, which have become normal for me, but, as I said, I will never be like others. It makes life difficult for me, but I have to deal with it simply because these disorders will never go away. Being diagnosed was terrifying and I rebelled against my doctors orders by taking myself off my medications without telling anyone, but now I know that I absolutely need them. No amount of deep breathing or yoga fixes anything. But once I got older, I realized that my official diagnosis was a blessing in disguise because I realized that it explained a lot of things in my past, things that I had gone through and behaviors that I had. That's kind of the short version. It's all hereditary, as well. Second, I've always had a weird obsession with fish. Betta fish to be exact. At one point, I had over 30 of them. The obsession was a sort-of coping mechanism for the feelings that I felt at the time. Thankfully, with the help of therapy, these obsessions, fixations, and feelings have been put in check. 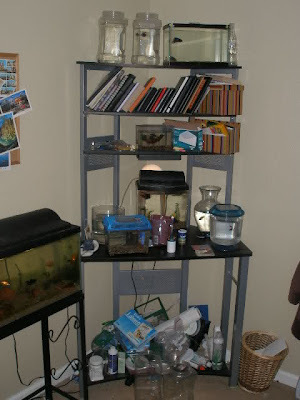 Just for reference, here is a photo from years ago when I was going through this 'fish period'. Crazy, right? Haha. The photo doesn't even show all of the tanks and bowls! Third, I have never, ever considered myself beautiful. I think that I'm fat and ugly and that nobody will ever want me. I'm too tall (I'm six feet.) and my face is enormous. I feel awful when around my closest friend (here at least.) because she is so much more attractive than me. I'd rather stay home, watch tv and eat food that I really shouldn't be eating in the first place. Fourth, err...I am nearly 21 years old and I still sleep with my gross, tattered baby blanket...It's name is 'Kibi'! Fifth, I am extremely paranoid, especially when it comes to things of the paranormal variety! I fully, wholeheartedly believe in ghosts, spirits, demons, etc, and I absolutely REFUSE to live in an old home because of what could have um...been left behind, if you will. Sixth. I am terrified of growing old alone and un-married. Seventh. I want children so bad it almost hurts! But at the same time, I am absolutely terrified of passing my disorders or similar ones on to my children. I have mostly gotten over that because I feel like with the things I have been through, I will be able to help my child (if one of my children is diagnosed.) through his or her feelings and notice the signs of mental illness quickly. Does that make any sense? Eighth. One single person (who started out as a pen pal.) kept me alive during my late teen years. Her name is Monica and I cannot be more grateful for having her in my life. Aside from my parents (I wouldn't have done anything simply because it would kill them if I had. ), she has been the most supportive person I have ever had and guess what? I haven't even met her yet! Ninth. I am obsessed with having a neat and orderly bedroom. The only problem? IT'S NOT NEAT AND ORDERLY! It's actually been bothering me for months, but I can't seem to bring myself (motivate myself?) to clean it even though I KNOW it needs to be done! It just seems like such a daunting task. I think I might actually do it this coming week when I have two days off. Just completely empty out the entire room (which will be very difficult given that I have two running fish tanks in my bedroom...), scrub it top to bottom, vacuum, shampoo the carpets (If I can figure out how to work the damn shampoo-er. ), and organize everything. AGAIN. Tenth. My father and I had a horrid relationship up until very recently. It makes me incredibly happy that he now tells me he loves me even though I know I make his life hell. I 'hated' him for so long when I was in high school, and it breaks my heart to know that he thinks I actually do hate him even though he's been one of the most influential people in my life. My dad is my hero. I just teared up a bit there! Eleventh. I have an un-natural fear of death. It all began when I lost my grandfather a few years back. It terrifies me. My biggest fear is my dad dying. I still bawl like a baby when I talk about my grandfather. A few years ago, I had a dream that my dad died right before we left without him to go down to Los Angeles to visit my extended family, and I called him every hour on the hour just to make sure he was still alive. Yep, EVERY HOUR. Twelfth. I am insanely jealous of my 16 year old brother. he is perfect. perfect grades, perfect everything. The 'golden boy' if you will. I have always been the black sheep of my family and despite graduating high school a year early and trying my best at the things I do, I never feel like I am good enough. Thirteenth. I caused myself to have a seizure. At the time, I was mis-diagnosed with ADHD and I was abusing the medication, taking it by the handful and not eating because well, I wasn't hungry. I did lose about 15 pounds, but one day, I woke up on the floor of my computer class (I was 16 years old by the way.) with paramedics forcing an oxygen mask on me and a teacher stroking my hair telling me everything was going to be alright. To this day, I have not admitted this to my parents, nor my neurologist. My brain wave activity is still extremely abnormal, but the doctor has more or less said that it was probably like that to begin with. I am on a medication (one of the six I take.) for it and will be for the rest of my life. The crap thing is, this medication causes bone density issues and I could end up with early arthritis and early osteoporosis as a side effect. And lastly...I am completely, totally..BROKE. I work part-time, have tons of bills, and usually have about two dollars to my name the day after I get paid. Right now, I can't really hold a full-time job due to my inability to handle lots of stress, so I'm more or less up a creek without a paddle. I haven't purchased myself new clothes in I don't know how long! I would LOVE to be able to buy myself a new letter-set or roll of washi tape somewhere, but I simply can't afford it! Purchasing a bottle of nail polish this week was a HUGE deal for me and I felt so, so guilty after making the purchase! I do, however, ALWAYS allow for nine dollars to go to one sheet of stamps per paycheck! I will never, ever stop writing letters! My pen pals (I hate that word. They are my FRIENDS.) kept me sane during my bad periods, and agoraphobic times. Okay, that was WAY more than five or six, but oh well! Please share anything you like via comment! I would love to hear your thoughts! Kendra- I am so proud of you for being able to post this. It is definitely a huge step you opening up enough to share your fears. You are amazing girl... don't forget that, k? 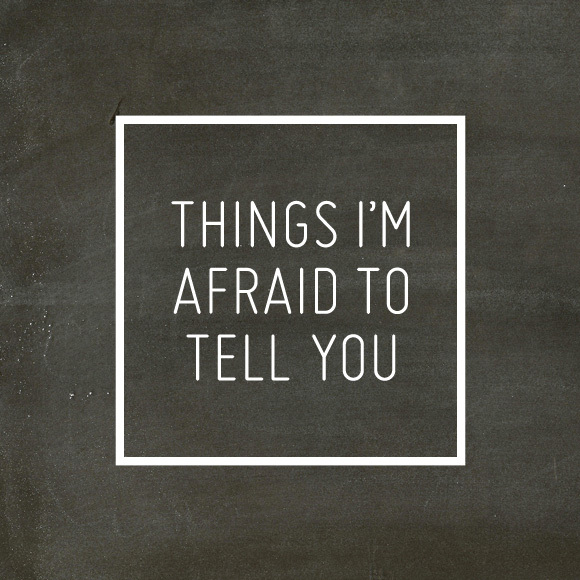 I have read a few 'Things I'm Afraid to Tell You' posts lately and each and every one has amazed me. I love raw, honest and open everyone has been. In the blogging world it's so easy to gloss over certain parts of your life and only post about all the fabulous parts. You're definitely not alone! I've got depression and anxiety and mild OCD. I was also mis-diagnosed with ADD and abused the medication. I need things to be neat and orderly but things are never neat and orderly ENOUGH. So I totally get it. I'm (significantly) older than you and just let me reassure you that it does get better. You learn how to better manage your symptoms and challenge yourself to do all the things that you know in your heart you can do. This post was just amazing! 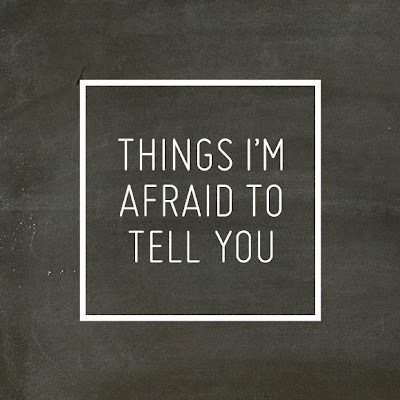 It made me think of things myself that I am afraid to tell anyone! It realy gets me thinking and is actually emotional to think about. There is a lot of things tht I hide everyday to put a smile on my face and let others think everything is good! Thanks kay I loved the post. very, very brave. I posted one like that myself now. You inspired me!